Welcome to the Kingdom Minded Show website. We've got some new independent artists for you this week as well as an interview with Da Scapegoat. He just happened to be in town and we had a chance to hang out for a while. We've got a link to his Facebook page below, so head over there and give him some support. We also have information about the Exodus Movement concerts on April 9th and 10th. On the April 9th at 5:30, they will be at the UCON Conference held at the Dream Center and on Sunday, April 10th they will be at Northwoods Community Church for the 9 am and 11 am youth services. You really don't want to miss this event. Exodus Movement is a nationally know group and are guaranteed to bring the Gospel in a way you won't forget. Ambassador is back with a new song and album. We've got the song for you right here at Kingdom Minded. June 18th is a reunion of Crusaders for Christ, a former Peoria Gospel group. Click here for more info. Enough news, here's the playlist. The Anointing In The First! Episode 1 Show and Playlist! Welcome to all the Kingdom peeps dropping by. Last night we had an awesome time with Broken, DJ Ezra, Momma's Boy, and One Accord at Rock Church. You missed an awesome concert and great time in the Lord if you weren't there. We'll put some pics up on here. Don't worry about missing any more concerts though, there is more to come this year. The next area concert is Exodus Movement on April 9th at the UCON conference at Dream Center and again on April 10th at Northwoods Community Church. We'll post the details here for you. Due to a women's basketball tournament taking place at Illinois Community College being broadcast on WAZU, we won't be airing a new show until next Saturday. As an internet exclusive, this week we decided to post the very first ever Kingdom Minded Show that aired December 11th, 2010. As I listened to this episode last last week, the emotions and feelings I had on that day came rushing back. It was so exciting and humbling to hear Sho Baraka's "Music of Life" pumping through the speakers of my car and coming from the radio. Not a CD or MP3! Hallelujah! I felt like doin' a victory lap or two around the apartment. I personally want to give a big, big shout out to my co-host and brother in Christ, Robbie Criss. God knew what we both needed and as we follow God's will together on this show, He's gonna do some major things in Peoria this season. There's a certain special anointing in this first show; so go press play and listen to the lyrics. There's not much speaking by Mr. Rob or myself. It's all music so pay attention to the lyrics. Here's the playlist. The links will be working tomorrow. We hope you enjoyed this episode and something was stirred up in you to be Kingdom Minded! Pull Up A Crate And Chill As You Listen To The Show! What's good Kingdom people? We apologize for the new show not being aired on the radio. Technical difficulties got in the way. Hopefully you enjoyed the prior weeks show again if you were tuning in. We have posted the brand new show right here at the bottom of the page for your listening pleasure. We're excited to announce an event that is happening this Friday night, March 18th. Rock Church is going hip hop for one very special night. Broken, nationally known artist and youth pastor at Crossover Church in Tampa, FL will be in the house and performing with special guests DJ Ezra and Mamma's Boy. We'll list the details below. You can hear 3 of Broken's songs on the show as well as a song by Mamma's Boy. 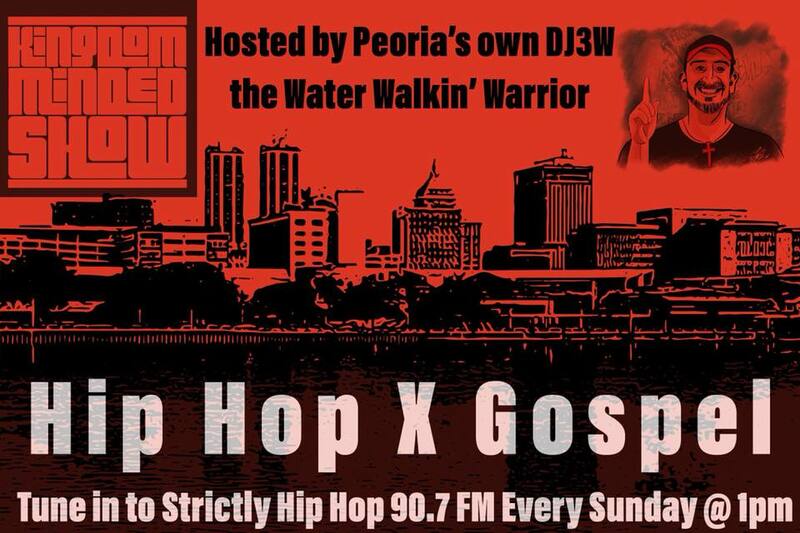 We've also introduced a feature called the "Phat Freestyle of the Week" at the top of the second hour. This week Street Pastor's "The Zoo" is showcased. Next Saturday we will not be on the air due to a Womens Basketball Tournament being broadcast on WAZU for Illinois Central College. We may be putting up the first show that ever aired next Saturday here on the website. Here are the details of the concert like we promised. What: Rock Church goes hip hop for one very special night! Who: Broken with special guests DJ Ezra and Mamma's Boy, Worship by One Accord. Make sure you tell a friend and come out to support this awesome event! Here's the playlist for this weeks show. Make sure to visit the artists pages by clicking on their song. Call us at 775-375-KMRS to leave a shout out for the show. We may play it on the air. Please don't forget to pray for Japan in this season of desperation and disaster. God is still in control. He is still on the throne and He's never far from us. We hope something was stirred up in you to be more Kingdom Minded. Get Ready Central Illinois! We are making plans to bring this to you! January 2011- If you are familiar with the work of these Christian rap artists then you are already aware of the impact that their music has had on young and old alike. If this is an introduction for you to the ministries of D-MAUB, k-Drama, and Yaves the Street pastor then you are in for a treat. The dynamic music and lively personalities of these young men make for an unforgettable concert-and the message they leave the audience with is one of hope and promise. The inDEPENDENCY tour will bring together some of today’s hottest artists in the Christian Hip Hop genre from the Midwest. The artists have put together an unforgettable concert as well as optional workshops on subjects such as living a holy lifestyle and surviving in the music industry as an independent artist. D-MAUB (One Route Entertainment) brings an unmatched energy and enthusiasm for the Word of God, and his unique delivery style captivates audiences. K-Drama (Cross Movement Records) is known for his playful, humble nature while still being an example of a mighty man of God. Yaves the Street Pastor (Sling Shot Media Group) delivers a gift of story telling through music, providing real life application as he displays the joy and peace that only Christ can bring. Separately these artists have been changing the face of Urban gospel, combined this tour will be one to remember and one that will change the lives of those present. Stay tuned for more information regarding this tour! Brought to you by the Kingdom Minded Show! Believin' Stephen's new video for "Suicide"
Thank you to Believin' Stephen for this socially important and eye opening song. This is what Christian hip hop is all about. Speaking truth in a world of darkness. The truth is you probably don't know half the people that have contemplated ending their life because of not being able to deal with an issue on their own. We are never alone regardless of how dark it looks around us. Share this with anyone that you think would benefit from the message. What's good Kingdom people? We are excited about the future and what the Lord has in store for us here at Kingdom Minded. This week we are unveiling the new David Michael song and briefly talking about the elements of hip hop, God being the primary one. If it wasn't for God, we wouldn't be able to express ourselves through this culture called hip hop. It's time to put God back in the culture. He grants us creativity and makes all things new. Who would have thought that years ago someone would put a record on a turntable and figure out a way to make it make a sound the player itself wasn't originally designed to make. He gave someone an idea to paint on the side of an abandoned building to bring some beauty and positivity back to a run down neighborhood. Somebody was given the idea to dance in a way that no one had ever thought of before. We owe everything we are to God and we want to give all honor and glory to the Father for allowing us to express ourselves through hip hop. Don't forget Exodus Movement will be performing at the UCON Conference on either April 8th or 9th and at Northwoods Community Church on Sunday April 10th. Here is the playlist for Episode 10 airing March 5th, 2011. Call us at 775-375-KMRS to request songs for future shows or to leave a shout out. If you are an artist and have a phat freestyle to submit, please e-mail it to KingdomMindedRadio@gmail.com for review and possible airing on the show. Hallelujah! We've officially been on for 12 weeks now. This has been a 2 1/2 year old dream come true. God is truly faithful and worthy of all the glory and honor! Without Him we wouldn't be on the air taking back ground from the "prince of power of the air". The adversary was trying hard to stop us this week, but the Lord came through at the appointed hour and the new show is up and airing as I type this. Here is the playlist for Episode 9 that aired on 2/26/11. You can click on the song title to find the artists home page or a link to purchase the song for yourself. 2. Off Da Hook - IzReal (Loser Mixtape) Free Download! 4. Nat Turner (Extended Version) - Slingshot Movement (Preface II: Before I Reach) Free Download! 18. Give It To You - JahRock'n Productions (The Lost LP) Free Download! 19. My Reflection - Cam (My Eyes) Available March 1, 2011! 23. Savior - Exodus Movement (ReDefinition) Available March 1, 2011! 26. One - Yaves the Street Pastor feat. KamBINO & Kierra Sheard (Prince Amongst Thieves Session 2) Free Download! We hope something was stirred up in you to be Kingdom Minded after listening to the show!